Mark Mardell's diary this week is a log of developments at the EU summit in Brussels, which ended in agreement on the bloc's 2007-13 budget. He describes the negotiating tactics and the mood behind the scenes, and observes the spin doctors and powerbrokers at work. 0235 The deal is done. 0220 The review wording says "the European Council can take decisions on all the subjects covered by the review". No date - but open to interpretation. So I was a little harsh: it is a compromise, deferring a row for another couple of years. Eighteen leaders have now spoken and all have said "Yes" to the deal. 0205 The roundtable meeting of leaders has just started. Jacques Chirac and Angela Merkel have both spoken in favour of the deal. A rumour that Lithuania is unhappy. Somehow I don't think a Lithuani1an veto will be forthcoming. 0200 The latest word is that the review of the budget in 2008 has nothing in it at all about when it should take effect. As it was a key British demand that it must be open for it to apply to the current spending round this is fairly extraordinary. If this was meant to be Mr Blair's fig leaf then he's now guilty of indecent exposure. 0125 I can't quite believe this but the leaders still haven't got together. I suspect they are trying to sort everybody's little niggles out in advance so they can just go round the table and say how great it is. Or that may be just wishful thinking. The Poles have been cutting up rough, saying they need more money. But in the same breath they say they're sure a deal will be done within hours. 2300: Why oh why do these things take so long? The full proposal is only being photocopied now and it'll be another hour or so before the full meeting of leaders, which we were earlier told would take place at 2000. The security guards are running a sweepstake on when they can shut up shop... the winner will guess the time when the door shuts on Tony and the measure. 2000: As a former denizen of Westminster I've heard a lot of loose talk about "spin" but today's negotiations show what it's really all about. The delegations of the various EU countries are still waiting to see the details of the latest British offer, but choice morsels have been dribbled out to the media. That rich countries will pay more, the British will pay more. But when I talk to my diplomatic contacts, they can't say what they think of the proposal because they haven't seen it. 1900: Confirmation that the overall budget will go up and Britain will lose 3bn euros (£2bn) off the rebate. I have got a feeling that Angela Merkel will be something of a hero in Brussels, because she proposed the sacrifice of richer countries paying more. But how will that go down in Germany, where she is imposing austerity measures? Not sure the Swedes and Dutch will exactly love it either. 1800: We are going to have to wait a couple more hours before we see the offer. But the Poles have just been giving a briefing, saying: "We are significantly closer to a deal." I think that's it: it's in the bag. Many a slip between cup and lip, and all that, but it's my best guess. Doesn't mean I will get home before the small hours though. 1600: What's the mood here? "No sense of threat from any delegation" is how one source is putting it. The Commission is busy working out a new set of figures on the rebate. It turns out the power politics is a lot more brutal than I had expected. My feeling was that Britain would get Poland on side and try to shame France. The politicians are much more hard headed than that: Britain, France and Germany work out what they can all put up with and everybody else will be bullied into falling into line. 1515: I'm told there is a deal on the farming review clause, but bargaining is still going on about how much of the rebate should go. 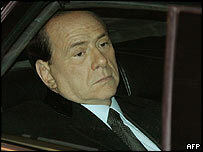 Berlusconi has left the building saying that Britain is in a very difficult position. Our number crunchers are poised to try to make sense of the next "negotiating box" as proposals are officially called. 1400: I've just stuck my neck out and predicted, on air, a deal today. There will be a new British offer after the leaders lunch. It seems Britain has agreed to give up more of the rebate. All morning, Merkel and Chirac and Blair have been haggling over a form of words on a review of the budget. Months ago, Blair started out demanding a change to the way the European Union spends its money, focusing less on farmers. He's backed down from that and is now asking for a review in 2008. He's got that already. The big question that's left is whether the door is left open to change spending before 2013 or only after that date. I think any compromise will stress that any country can say "no" to the conclusions of a review. But in the end it will come down to the rebate. This review is important for Tony Blair because it is the excuse for making not only a larger cut in the rebate, but for making it permanent. What they arguing about is the size of Mr Blair's fig leaf. 1230: I have just been to a briefing by the UK prime minister's official spokesman. Basically, Blair has been in meetings with Chirac and Merkel most of the morning and he's going to report back to the others at 1300 local time. The spokesman says that Mr Blair wants to settle "certain issues first" as a priority. You can bet that means they are still trying to thrash out a deal on the rebate and wording of a review of the Common Agricultural Policy. 0025: All the leaders have gone home, or at least gone back to their hotels and embassies. The look on Berlusconi's face, waiting for his car to arrive while all the other leaders stepped into their limos was, as my gran would have put it, a picture. Not a man I would like to cross. And one of my diplomatic sources did tip me off to "watch out for the Italians!" It's odd that the feelings and disposition of this founder member country are rarely discussed. They keep their own council, but while Silvio may entertain Tony over the summer hols he may not turn out to be such a friend at this summit. So what happened over the Devonish Red and Northern Ireland lamb? I've got a strong feeling that Britain has been bitten by its own dog. For a couple of weeks now, the Foreign Office and Downing Street have been arguing that it isn't going to get any better than this: if a deal isn't reached by this weekend it can't be under the Austrian presidency which starts in January or the Finns who hold the reins after that. They haven't quite said that Britain would veto any deal on offer next year but logic is on their side. If the devilishly clever but dastardly underhand British (that's how the Foreign Office flatter themselves we're seen by the rest of Europe) can't design a deal to their own liking during their own presidency then how can anyone else come up with anything more acceptable? Well, many leaders have bought this argument - or at least pretend to have done so. They emerged suggesting that a deal simply MUST be done by this weekend or it is inevitable that the European Parliament will be left in 2007 to set the deal year by year, and their proposals would be, in the words of the Swedish prime minister, "frightening". But nearly all scoffing their Northern Irish lamb round that dinner table demanded big cuts in the British rebate. As I write I am pretty sure Tony Blair has not decided which way to jump. The number crunchers will be up all night crunching. Those fragile lines between Downing Street and the Treasury will be burning. So what's it to be? Blair swallows a big cut to the rebate and puts up with the third (or is it fourth?) headline in the Daily Mail declaring that he's "betrayed Britain"? Or he swallows the contempt of other European leaders who'll feel he's "betrayed European solidarity"? At one time I would have been sure that this politician, with a surer touch than any other I have ever observed, would have found, for want of a better phrase, a middle way. Now I am not so certain. He will have to decide by 0810 British time when Jack Straw is on the Today programme. Lots of countries are coming to the conclusion, almost undeniably right, that this is a crazy way to set a budget. I don't mean the late-night poker-playing atmosphere. That's politics. No, its the growth of a system so organic that it's twisted as an elderly oak. Britain would argue that it's the Common Agricultural Policy that is the original perversion. So Britain gets a rebate. We're used to that term. It means getting money back from your subscription to a club because you don't get as much out of membership as other members of the club. Bit weird, but OK.
Holland, also thought to be paying too much because of the amount of money flowing through its ports gets cash back through a different mechanism. Sweden, which is thought to pay too much for other reasons, gets money back by a different route. And now there are scores of clever little schemes to buy off countries which at this time have individual complaints at budget-setting time. The latest is something to do with VAT and the eastern countries, of which I've heard four different explanations, none of which make sense. I may bore you more on that one if I have time. Of course, those who dislike the European Union project would say this proves that 25 countries cannot hang together. Enthusiasts would say the answer was a simple direct tax paid to the EU. Not my place to comment, even if I was sure what I thought, but I do think it's obvious the current system is so full of contradictions that one day it will implode. The UK may save its best offer until Mr Chirac has had his "third beer"
2130: It sounds to me that the dinner is going to break up early and there'll be no talking through the night. Maybe it's the effect of that Welsh white wine. Many countries are already irritated with the Brits for starting negotiations very late, coming up with hard proposals very late, and coming up with a second offer very late. Maybe it's all a tactic and the first real offer won't go on the table until tomorrow. The general view of British tactics seems to be low, crude and clever. 1845: A Polish source tells me that their trouble now is that the first British offer damaged them by imposing a cut, and the second offer insulted them by offering a bribe. Several diplomats have told me the difficultly at this summit is not financial but political, meaning the cash involved is, as one British source puts it, "lollipop money" but the awkwardness is selling the headlines back home. I reckon that Michael, writing below, is spot on - it's psychological. Not, I hasten to add just for the Poles, who bridle at the idea they are being treated like second class citizens of the EU, but everybody is driven by their own national psychosis. The British worry the whole of Europe is leeching off them, the French worry they are no longer in the driving seat and so on. 1800: No real word on how the meeting between Blair and Chirac went, but I can bet the French president won't like his dinner. Recently he said the British couldn't be trusted because of the dreadfulness of our food - matched only by the Finns, he added. So tonight, he gets Cullen Skink (that Scottish fish soup), Northern Irish Lamb and cabbage, English Cheese. And get this, a Welsh white wine and a red from Devon. British diplomats are sniggering hard. Me? I think he's being very rough... on delightful Finnish reindeer and herring. 1400: Just back from a castle and botanical gardens on the outskirts of Brussels where the conservative EPP group are holding their pre-summit meeting. The new German leader, Angela Merkel, says that getting a deal will be very difficult, but I think she could be a key player, banging heads together. Behinds the scenes the mood music is very much more positive than the harsh language in front of the cameras. Nevertheless, the most significant news so far today could be the joint French/Polish letter to the Financial Times, calling for more money. It's not the content that's important, but the fact of a new alliance. 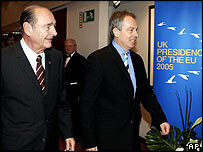 Chirac offended the East during the Iraq war, but the British position of cutting money to them has allowed him to make friends again. It means that if Blair doesn't get a deal this weekend he has made a blunder of catastrophic proportions for British diplomacy, offending countries that wanted to be British allies for no gain. 1000: A bit of a lie-in this morning because I'm told the British tactic is to go into the small hours tonight, to discover if a deal is possible, and what people's real bottom line is going to be... If so, another all-nighter on Friday/Saturday can sort out the details, if not everybody might as well go home. An experienced diplomat from one of the "old" 15 member states puts it more succinctly: "The Brits will wait until Chirac is on his third beer, feeling like he wants to go to bed and then they'll come up with their real compromise." There's always a moment of relief when one's confident, on-air predictions are confirmed. The British proposals are as I described: nothing on the rebate, with a wedge of money aimed straight at Poland. But these proposals too get a dusty reception. One British source is clear about what they've done: "It's like mugging someone and then sitting them down with a nice cup of tea and promising to drive them home." But he's also clear that they either have to put up with it or endure "a year of turmoil": the British threat is they will veto any deal next year. I get an early hint about the new British proposals. Bigger budget than the first offer, more money to the East not a penny more shaved off the rebate. It's clearly not the final offer, though. Most prime ministers will expect a firming-up to make the rebate offer permanent and more money on the table. The British insistence on a meaningful budget review in 2008, with cuts in farm subsidies a live option, is going to be a major sticking point. After doing a live two-way on the BBC News at Ten, I reflect mournfully on the difficulty of pitching this story so both viewers new to the story and those completely up to speed get something from it. Even "less" and "more" are problematic: What should we compare it to? The current budget? The budget proposed by the Commission? The Luxembourg offer rejected in June? The first British proposal? It's not a nuance, the first gives you a headline about "massive increase", the second "massive cuts". 1230: French news conference. The foreign minister suggests that the process of the EU getting bigger - which Britain is keen on - may be stopped if the budget can't be fixed. A decision on Macedonia's application is put on hold and directly linked to the budget. It's widely thought he's telling Britain "Drop your rebate, or the little guy gets it!" 1100: I'm told foreign ministers decided not to bother with discussing the budget. 0830: Foreign ministers' meeting, but they have no new proposal to discuss. One of those slightly dispiriting days when you've got to follow developments closely without much chance of getting anything broadcast. Sometimes you can curse at the news desk for not running the latest line, but not today. It's not worth it. On his way in, Foreign Secretary Jack Straw tries to condition us to failure. He reminds us that six years ago the negotiations weren't sorted out at a similarly timed summit, and the talks are now much more difficult. Most countries' foreign ministers simply rejected the last British deal. One Spanish negotiator is more subtle. He tells me he's seen Chancellor Gordon Brown's offer, but he's still waiting to see Prime Minister Tony Blair's offer. There's a feeling here, which I think is accurate, that the chancellor is not keen on any deal that gives up even a part of the British rebate. I'm sure tensions between numbers 10 and 11 Downing Street are making these complex and fraught talks even more difficult. The Poles will be the key to summit success or failure. If they buy the deal, including the cut of 10% to the money going to the new countries, it will be seen as churlish if anyone else tries to block it. Leaving aside the blame game for a moment, I do find it noteworthy that the UK has been much more criticised for the way it has managed these negotiations than the Germans were during similar negotiations in 1999, when an equally grubby budget compromise was reached. The Germans refused to provide more money and the French secured a deal on CAP financing (yes, history repeating itself). At least from Brussels, it feels as though there's something of a double standard in the way that the UK is viewed relative to other Presidencies. There is a word in computer jargon - "crufty". It means something that is overly complex - especially something that has been around for a long time and had all kinds of bits added to it, the purposes of which have been lost in the mists of time. The EU budget process seems rather like that - it was developed for 6 countries and now has to serve over 20. Maybe it's time to start again from a blank slate? Do we want to have our countries with almost all the population living in big towns? Who will be care about our countryside? This is the European future if we don't aid farmers with real money. It's necessary and strategic to have farmers in our countries, because of two main reasons: First one is if something happens with our food suppliers outside Europe, where we will find food for us? Second one is that we need to have people living in the countryside. I know hundreds of little villages uninhabited in Spain. I don't know if CAP is the correct solution to avoid this two problems, but in my opinion it's necessary to give a subsidy to European Farmers, at the same time as we find solutions for Third World people. Many comments here suggest Britain, and Britain alone it seems, is being selfish. Are the old rich counties who benefit from CAP not be selfish, are the new members, desperate to get their hands on others cash not being selfish, I'd say all are being selfish, that's the nature of politics, and there is nothing more grating than the French in particular banging on about solidarity when they are at least as responsible as anyone else for the problem. Isn't it time to take a deep collective breath and look, really look at what agriculture in Europe and the US has become? Small time farmers have all but disappeared, fresh local produce is the stuff of fairy tales and people actually get money to destroy crops and foodstuff!! Credit and funds go only to large companies who dictate lifestyles and eating habits; there are millions of people who are unemployed and displaced, simply because progress implies using machines and driving ridiculously large cars and burning precious fuel for no reason, making useless conversations on cell phones instead of the joy of personal contact and real live conversation. Probably the entire world would stand to gain, Europe certainly, if local produce was readily available to the local consumers. Perhaps then, we could visit each other in Europe and experience a living culture along with traditional food and life style(and less obesity). It's not too late. Maybe squabbling over funds will finally supply the incentive to question the way world economics is going to benefit a few and for a very short while, given the fast decline of resources, and work out a way to make globalization a word not to fear, but one befriend the world's populations, Europe and US included. If the deal comes about then the EU leaders should not shirk the opportunity that the 2008 budget review would present. By then they must also have sorted out the Constitution i.e. the overall objectives of the EU. So there is an opportunity to renew and set the agenda for the next 30 years of the Union. If we let this bang on til 2013 we're just making it harder to compete in the world. How badly served we are by the Foreign Office in all of this. The original disaster was in 2002 where poor strategy allowed the UK to be comprehensively outfoxed. Now we are the bad guys, trying to unpick an existing agreement, alienating our Eastern allies and almost certainly plunging Blair into crisis at home. Just as with Iraq, Foreign Office incompetence has allowed others to paint Britain as nasty and faintly ridiculous. If there's a silver lining, we'll probably see the true measure of Cameron now, will he go for the easy applause of the Daily Mail or deal with the true subtleties of the rebate? It has become somewhat of a new religion to be "anti-CAP". Instead of saying that it is ridiculous to spend 40% of the EU budget on "French farmers", who are also Spanish, Italian, Polish and British by the way, it would be more honest to come out and say that Britain doesn't have much agriculture left and eating good food is not so important for its people, anyway. Shipping apples from New Zealand or Africa, instead of the Channel Islands is acceptable for most Brits regardless of their taste, freshness and the damage, the shipping does to the environment. The CAP is a huge weight on Europe, there's no doubt about it. Nobody should reasonably expect the British to allow a cut in their rebate unless the CAP gets the same treatment. Of course, the CAP is riddled with problems: it's too big, too many of the wrong people are entitled to it etc. However, whereas the British rebate today is not needed by the British (they are Europe's foremost economic power), I don't think that many of the people who are against the CAP realize what cutting it would mean. The CAP is one of the only things that keeps our farmers alive today. If it weren't for the CAP, they would be forced out of business by the far more competitive third world agricultural powers, such as Brazil. This would only be fair, I suppose, and speed up development enormously in these countries. But are we ready to let rural and pastoral life disappear in Europe? British spin doctors have done a great job. The Common Agricultural Policy represents indeed 40% of the European Budget. But it happens to be the only European Common Policy! This means that it is the only area where all the money comes from Europe and not from the states. Comparing this with other fields such as education, R&D, health, etc. is not fair since for them, most of the money is distributed by the member states themselves. The CAP is the only area where Europeans have succeeded to have a common policy. This obviously does not mean the CAP should not go through further reforms but rather that we should devote more money at the European level in other fields, not have such a tiny European budget. The position of the other 23 EU countries must be based on a correct reading of the basic natures of Britain and France. They know that there is absolutely no way ever that France will do the right thing by them. France is for France and for France alone. They also know that Britain really does have a sense of fair play and a strong sympathy for the underdog. Given this, they know the only way to get what they want is to go after Britain. It is the only one of the two who might give in. France would see them all in hell and the EU in ruins before agreeing to give up anything. It is long past time for Europe to stand up to France and tell them to join in or get out. France should think beyond her own self interest and listen to Oxfam speaking for the millions of people kept in poverty by the CAP. The honour of France is at stake. Pressure is increasing on the Norwegian government to reduce it's subsidy level, in large part due to pressure within the EU upon the CAP. The arguments are the same, the money could be better spent on investing for the future, education, research etc, than on economically inefficient agriculture. Please Blair don't back down now. Give away the rebate yes, but only once it is certain we are paying for investment, not potatoes. I would respect him far more for collapsed talks on a matter of vital principle than a crummy deal for the sake of what exactly??? It really must be possible for the EU to agree that contributions be based on Gross National Incomes of each country and then to argue over the way the 1.05% (or whatever) is to be spent. Roll out the pork barrels it's divi. time. What should really happen is that all budgets should be suspended until water tight systems are in place so that a clean audit report is received after 12 years. Otherwise commissioners & countries should be surcharged the legal & audit costs of rectifying the systems & recovering all over paid money. What I don't understand is that no effort has been made to isolate France. France is the only one who wants to keep wasting 40% of the money on CAP. And the rest of the EU, and the WTO all want those subsidies gone. So why doesn't it happen? If there is a villain in this, it's Chirac, not Blair. Focus on France, people. 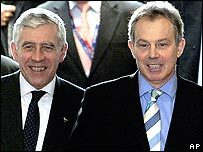 If Mr Blair thinks surrendering the rebate without a quid pro quo from France will get him more influence in Europe he is mistaken. I am part of a minority on the mainland that likes Britain as an EU member. French farmers and M Chirac should remember that though Germany lost the War, and have been paying them compensation through the CAP, British pensioners are supposed to have won the War, and deserve better pensions well ahead of harmful (to the 3rd World) subsidies for southern European landowners from eg Italy, Spain, Greece, Portugal and France. 1) The CAP represents 40% of the EU Budget. 2) Europe needs urgently to invest more in Research and Development. 3) Has anybody thought what would happen with the whole EU economy if we were spending a 40% of the EU budget in R&D? Surely, Europe would be the brain of the world. 4) Furthermore, what would be the situation of the EU farmers if we were spending that colossal sum of money in R&D? I mention it because, nowadays, one of the most important branches of the modern science are the life sciences. So, in my humble opinion, supporting, or not, our farmers, no matter if they are French, British or Spanish, is not the question. The question is if the present form of CAP, and the present form of the EU budget, are really useful for the farmers and, of course, for the rest of the European citizens. For me, the answer is, absolutely, NO. It is ironic that the UK advocates enlargement to poor countries such as Turkey and does not want to lead the pack in paying more for poorer states. I must also agree that failure to reform the CAP may hinder Europe's capacity to build itself strong... I also wonder how much of the EU budget is allocated to these summits... they seem to be dragging forever at the expense of the taxpayer. It's hardly surprising that Chirac wants a cut in the rebate, France funds about half of it anyway so they would end up paying even less than they do now. Under no circumstances should we agree to a reduction without CAP reform (despite the undoubted French strikes and blockades that even the suggestion of reform would provoke). However, spare a thought for Germany in all this. They pay nearly 250% more than France, and 100% more than the UK. It's about time we all shared the load more evenly. CAP reform should go together with rebate reduction and asap. Agree that's better no deal than the bad one. Money from the budget should be spent more wisely - on science, new technologies etc. otherwise EU is facing to be overrun on global market. Your quote from the diplomat is spot on. It also highlights the fact that these negotiations always run in the same way and a lot of it is show. Even if a tentative agreement were reached now they would wait until the 11th hour and the 61st minute to announce it. Tony Blair should fight the French and force them to "readjust" the CAP. France cannot control Europe; much as they would like to. Germany may not be so eager to join with France now that they have a new Leader. These budget negotiations just sum up where the EU stands today. It is often the case that leaders of the Member State countries enjoy talking grand ideas about "European solidarity", building a "stronger Europe". But all this is proved to be a load of rubbish when it comes down to the crucial question of money. European solidarity does not exist (and never really has). All Member States care about what they get out of it all themselves! Germany is no longer willing to bankroll the project; France is scorns the idea of financing anything which does not conform to its "vision of Europe" (ie CAP) and the UK, an ever sceptical European player, does not see why it should be left carrying the can. These budget negotiations are a reflection of the state of the much larger debate on the future of Europe - which is, in short, a mess, as always! The question now is, can the EU25 "fudge" their way out of this one? Nations as much as individuals live largely in their imagination and psychologically the Poles have justifiably felt sold down the river by the Allies since Yalta and the lamentable sycophancy towards Stalin. Their brilliant Spitfire Squadron 303 was even denied a place in the celebrations at the conclusion of the war, the charismatic pilots who survived watching tearfully from the sidewalks of the Mall. Such memories run deep here and are not forgotten. What sort of response could you possibly expect from them when they feel threatened by an EU summit now that the country is at last free to play a proper part in European affairs? The admittedly inexperienced present government is finally attempting to throw off the corrupt remnants of the former communist regime which has dogged progress since 1989. Their stance is as much an assertion of identity as a financial imperative. Read your history and have some compassion for Poland - it is no longer Edmund Burke's 'country on the moon'. I can't believe the British dropped the ball on this. The rebate is a piddly 5% of the EU budget. the CAP is 40%. The only way to get rid of the foolish CAP, is if Britain sticks to the offer: rebate reduction for CAP reform. Tony Blair is doing a great job and is trying to prepare the EU for the challenge of globalisation. But, Britain should pay for the new EU countries, because Britain is one of the richest country in the EU. One reason: the government didn't support the farmers like France or Germany.